Video collaboration is a must-have in today’s business environment, but video collaboration solutions are not one-size-fits-all. To get the full functionality you need—including reliable video, clear audio, collaboration capabilities, and a user-friendly interface—you usually have to invest in multiple solutions. That can hurt your budget, and hurt user adoption, too, as people get frustrated trying to master and manage multiple technologies. But what if it didn’t have to be that way? Here are three ways your collaboration solution could be making your life easier instead of harder, regardless of the space it is in. Traditionally, rooms of different sizes required different kinds of collaboration solutions. That creates a lot of frustration for users who must learn different systems, depending on the meeting room. It also creates frustration for meeting participants who have to wait while the host fumbles with the technology and struggles to get the meeting started. According to a recent survey, 66 percent of respondents said their top frustration with meetings is that they don’t start on time. With five specific solutions, COLLABORATE® Live gives you the best of both worlds—a solution that’s standardized AND can be tailored to your individual spaces. COLLABORATE Live 1000 provides a rich collaboration experience in large rooms including boardrooms, auditoriums, conference rooms, lecture halls, courtrooms, training centers and telemedicine facilities. Collaborate Live 1000’s key feature is ClearOne’s newest beamforming microphone product, the Beamforming Microphone Array Ceiling Tile (BMA CT). Within the space of a standard ceiling tile, the BMA CT provides full-room microphone coverage, smart beam selection through adaptive steering, noise and echo cancellation, and amplification. Not to mention that the integrated design means you don’t have to sacrifice aesthetics for functionality. COLLABORATE Live 1000 also includes COLLABORATE Space cloud conferencing, Skype® for Business client, SIP/H.323 video conferencing, wireless presentation, interactive whiteboard, recording, and streaming. COLLABORATE Live 900 is also designed for larger meeting and collaboration spaces. Features include SIP/H.323 video conferencing, COLLABORATE Space web conferencing, Skype® for Business client, wireless presentation, an interactive whiteboard application, recording and streaming. To support this powerful combination of video components, audio capabilities include the Beamforming Microphone Array 2 with adaptive steering technology. Think of it as a smart beam selection for unsurpassed coverage. 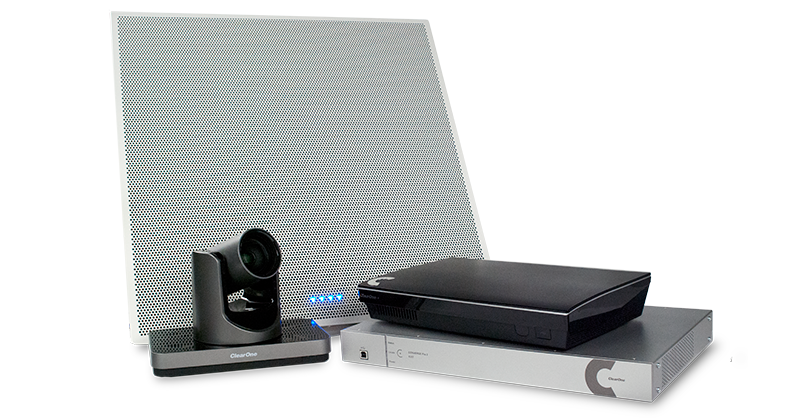 COLLABORATE Live 600 delivers crystal-clear, full-duplex audio for medium-sized conference rooms. It has the same suite of built-in video conferencing capabilities as the COLLABORATE Live 900, including the UNITE 200 PTZ camera. It comes with a 90-day free COLLABORATE Space trial subscription as well as two ClearOne CHAT® 150 speakerphones for clear audio. COLLABORATE Live 300 is a complete small-room and executive office video collaboration solution with the same simple and user-friendly interface found in the larger room systems. COLLABORATE Live 200 is designed specifically for huddle room spaces and huddle room budgets. It features a UNITE 50 EPTZ 1080p30 camera with 3x digital zoom and a 120-degree wide-angle field of view. Millennials are the largest generation in the workforce, representing one-third of current workforce participants. These are digital natives who expect their workplace technology to be as intuitive and easy to use as their personal technology. Forty-two percent of Millennials said they would leave a company due to substandard technology, and 93 percent of Millennials said up-to-date technology is a key factor when choosing a workplace. Not meeting those expectations can cost a company dearly—Gallup reports that Millennial turnover could cost the U.S. economy as much as $30.5 billion a year. With a user interface as simple and familiar as those on a cell phone or tablet, COLLABORATE Live will keep Millennials happy—and all your employees productive. You know you need good video for your boardrooms and conference rooms, but maybe you’ve neglected it in your huddle rooms because it seemed like too costly of an investment for a small space designed for people to pop in and out. And you wouldn’t be alone—of the 32.4 million huddle rooms around the world, less than 2 percent are video-enabled. Or maybe you’ve relied on less expensive options like a laptop with a camera, but they aren’t providing a good collaboration experience for your users. With ultra wide-angle video capture—which allows viewers to see everyone in a small space—the COLLABORATE Live 200 is designed to address the unique needs of huddle spaces. And it’s specifically priced for huddle room budgets, too. Learn more about the COLLABORATE Live series and which product best meets your space and collaboration needs.